The federally mandated rule goes into effect Dec. 18, and commercial vehicle inspectors will issue citations to motor carriers operating vehicles without ELDs but won’t place vehicles out of service until April 1. Some concerned cargo owners have already moved freight to railroads to hedge against over-the-road rate hikes. “We’ve seen a portion of the impact with shippers moving to higher ground — to carriers they know are ELD compliant,” said Jim Filter, senior vice president of intermodal at Schneider, which is ranked No. 6 on the Transport Topics list of the Top 100 for-hire carriers in North America. 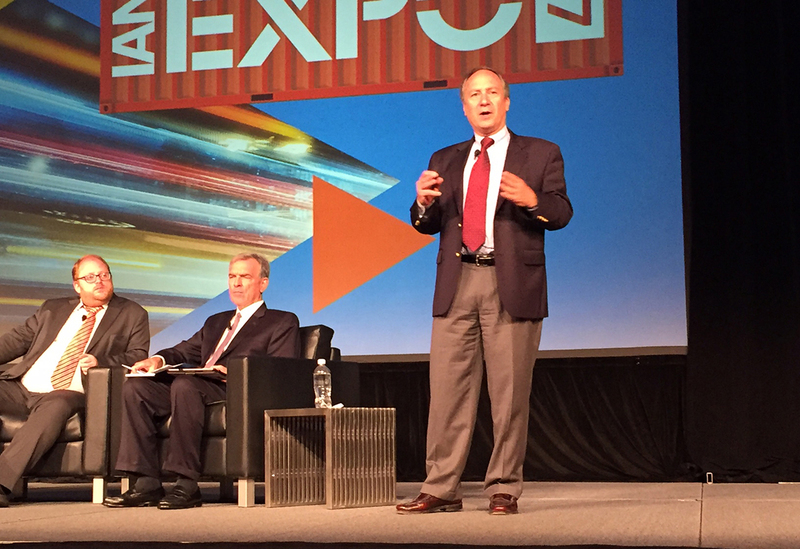 Larry Gross, intermodal expert at FTR, said that ELDs will push asset utilization past 98% in truckload. With fewer available trucks, contract prices will rise. And when they do, the financial incentive to use railroads will increase, Gross said. “Intermodal will benefit from this, provided that the drayage and port cartage community is also prepared related to ELDs. Even though you have exemptions for a 100-mile length of haul, there is a lot of potential ELD impact on the drayage community,” he said. One drayage provider, California Multimodal, spent three years choosing an ELD provider and teaching drivers how to use the devices, even though CMI’s drivers are independent contractors. CMI Director Robert Loya told IANA conference attendees that he’s concerned about what will happen at the Ports of Los Angeles and Long Beach. “Working hand-in-hand with the ports and terminal operators is going to help us. Look at [Long Beach Container Terminal-Middle Harbor] getting the turn times under an hour, stuff like that is really going to help our drivers. We’re 100% for automation,” he said. One executive at Schneider said productivity dropped 3% to 5% when it implemented ELDs in 2010, though no one can say how many truck drivers will leave the industry once police ramp up enforcement of ELD use come April. Other analysts believe ELDs won’t send the massive shockwaves some initially feared. “People thought it would cost a lot of money and many would go out of business because of it. Our new thinking is that the cost will be minimal and the impact will be zero on most of the freight that is moved. However, where it does make a difference, the difference will be dramatic,” said Lee Clair, managing partner at Transportation and Logistics Advisors. Shippers who cover their eyes to stay within their transportation budgets will have to confront a harsh reality, executives and analysts said. Frustrated independent contractors might use the mandate as a reason to leave the industry because there are new jobs popping up in construction with nights at home and more opportunities could emerge in the hurricane-ravaged parts of Texas and Florida. “To me the drivers who object to ELDs are drivers I don’t want anyways. They are intentionally violating the law and they’re either going to leave the industry or they’re going to some place where they can hide,” said Greg Stefflre, CEO of Rail Delivery Services.